The osprey from Maine searches the clear water of the South Branch for a meal as she takes a break from her 2,500 mile journey north. The letters, DV, can be seen on the blue band attached to her right leg. The warmth from the mid-morning sun felt good on my back as I paddled the low, clear water of the South Branch. The cloudless sky, directly above, was a darker shade of blue, its intensity pure and endless, and mesmerizing. It compelled me, as the devil’s advocate, to search for just a single speck to interrupt its perfection. Suddenly a shadow sped across the water, momentarily stealing the sunlight. I instinctively looked up to catch a glimpse of an osprey circling above. The white head, streaked with a dark brown stripe, was instantly recognizable. The osprey proceeded downriver by making tight overlapping circles in its search for fish. It isn’t too hard to imagine some of these super intelligent predators realize a canoe is herding the fish ahead of it. When the osprey was about 150 yards downstream it tucked its wings and dove into foot deep water to come up with a large white sucker held fast in its black talons. The bird oriented the position of the fish to cut wind resistance as it flew out of sight. Ospreys are ever present on the South Branch, typically from early spring to mid autumn. They feed primarily on live fish. I see them most often eating white suckers, a fish large enough to compensate for the energy spent to catch it. Osprey on a riverside perch, dining on fresh fish during the 2014 NJ opening day of trout season. 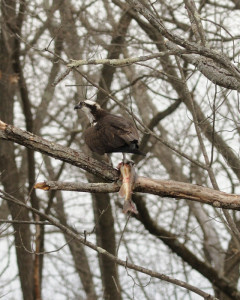 Earlier this April, I noticed an osprey perched in the same location day after day. This wasn’t typical of the local ospreys that ranged far and wide in their constant search for food. I was able to get a few photos and noticed a blue band on the right leg and a silver band on the left. 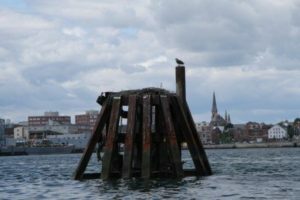 I reported the band to the USGS website, BandReports@usgs.gov, to find this osprey was banded in Portland, Maine, July 27th, 2011 while it was still in the nest, too young to fly. Osprey migrate from the northeast, where they breed, to central and South America each fall, a trip of more than 2,500 miles. This bird was apparently on its way back to Maine and stopped to rest. Osprey, like other migratory birds, are very loyal to nest sites and return to the same location with great predictability. Consider our visiting osprey will be 5 years old this July, and has 25,000 plus, frequent flyer miles on its account, you have to recoil in amazement, wonder and respect for its strength and tenacity. As osprey can live 25 to 30 years or more, the mileage really adds up. Our Maine visitor, a female, as evidenced by her speckled décolletage, has a bright and long future and hopefully will stop along the South Branch again on her journey to and from Central America. No doubt other osprey are flying to northern breeding grounds through NJ, so the opportunity to spot a banded bird along the North and South Branch are quite good. The reporting of banded birds is critical to wildlife research as it helps to unravel the mystery of migration, the location of breeding grounds, longevity, and other variables that impact the health and status of local and overall wildlife populations. The preponderance of osprey nests in NJ are along the Delaware River and Atlantic shoreline, its estuaries, bays and rivers, so keep an eye out for banded birds and report them to BandReports@usgs.gov . The researchers are as excited about a band report as you and will send a certificate of appreciation with relevant data about your bird. Many species of birds are banded, so don’t forget our eagles, hawks and songbirds. Opportunities abound as NJ is on a major flyway, the rivers being main exit and entrance ramps to our backyard. *Joe sent us an update to this post, a photo of the exact location in Maine where the osprey was born. Photo courtesy of Lauren Gilpatrick at the Biodiversity Research Institute, Portland Maine. 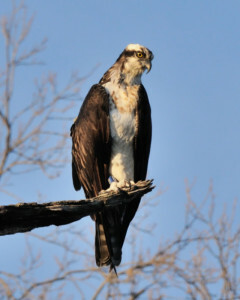 See, http://www.conservewildlifenj.org/education/ospreycam/ for more details about NJ osprey project and live osprey cam. Special thanks to Robert Somes, Kathy Clark and Ben Wurst for their enthusiastic help and support.